This was created digitally in CraftArtist. 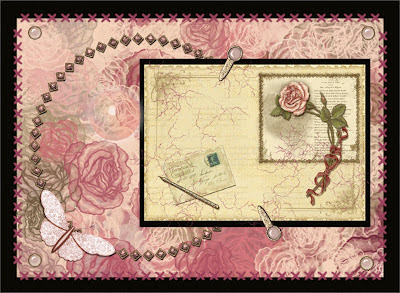 The backing paper and main image are from Peerless Designs Simply Floral CD and the embellishments are from designs by Pam Lefors. The cross stitch and crackle are brushes in CA. This is lovely Caroline. I really must get to grips with CA. Thank you for joining us again at CD Sunday. Hi Caroline. I love the crackle effect. I will also get to grips with my CA - sometime. Thanks for joining in with us again. Love this Caroline, can't remember seeing the crackle effect is it with a digi kit or am I just not looking properly. Anyway gorgeous card and perfect for the challenge. Thanks for joining us. A lovely card that looks so 3D. I am another that must get to grips with CA.